Originally founded in 1775 as the Continental Army (before the creation of the United States) the modern United States Army was created by the US Congress in 1784. The United States Army's primary mission is to provide prompt, sustained combat on land as well as stability and reconstruction operations. Moreover, the United States Army is charged to provide logistical and other capabilities to enable other Services to accomplish their missions. The United States Army supports national security and homeland defense strategies, and deters aggression at home and abroad. 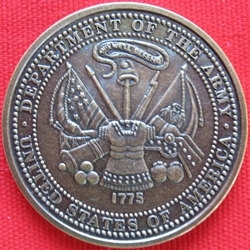 This coin honors the commitment of the United States Army to remain relevant and ready with capabilities to dominate across the full range of military operations in the defense of America's global interests.